In which G.M. Norton answers a question that you’ve been wondering for a long time. So to prevent further incidents, I thought I would dedicate an entire periodical posting to answer this oft-asked of questions. As I know that in these modern times, some readers would just like a quick answer while the more esoteric of you will enjoy my long drawn out wafflage, I have something both tastes. I don’t put much thought into an outfit. Usually, the look is based around a particular item such as a jacket or tie and then I grab other things that I think will go well with it. Still reading on? Very good. I knew I could count on you. I’m the kind of fellow that relies on his razor sharp instincts. For me, there’s no detailed plotting going on when getting dressed. In the winter especially, the cold temperature will provide all the encouragement I need to get dressed quite quickly. I’d rather be warm, you see, than stood there in my undergarments scaring the neighbours. As you will have read in the short response, it is true that my outfits are usually based around a particular item of clothing. I may have a natty new tie that I picked up and want to show off to the world. Or a favourite shirt that I’m keen to enter. Some chaps may decide what they’re going to wear the night before, and perhaps lay things out on their Corby trouser press. Regretfully, my Corby trouser press has been relegated to the attic since we moved house five years ago. We’re a little tight on space in the current pad. In the evening, I’d too preoccupied with books and downing a gin or two to be stood deliberating. So when morning comes and the first cup of tea of the day has been consumed, I will glide out of bed and open the wardrobe doors. Now, my wardrobe isn’t like the one in Narnia – there’s no alternative world looming at the back. My wardrobe is one of those PAX ones from IKEA. More veneer. Tsk. Now, let’s say that I’d like to wear my rust work shirt from Simon James Cathcart. A fine choice, I’m sure you’ll agree. Well, I put that on and as I’m stood in front of the mirror wondering who the devil that shaven headed cretin is staring back at me, I realise that like Robin Askwith from the Confessions films, I too have no trousers on. I often favour my high-waisted trousers from Spencers. I have three pairs – a red moleskin, a brown corduroy and a grey wool flannel. Rust and red are never going to go particularly well together so the choice is between the brown or the grey. Usually, brown wins. But not today. 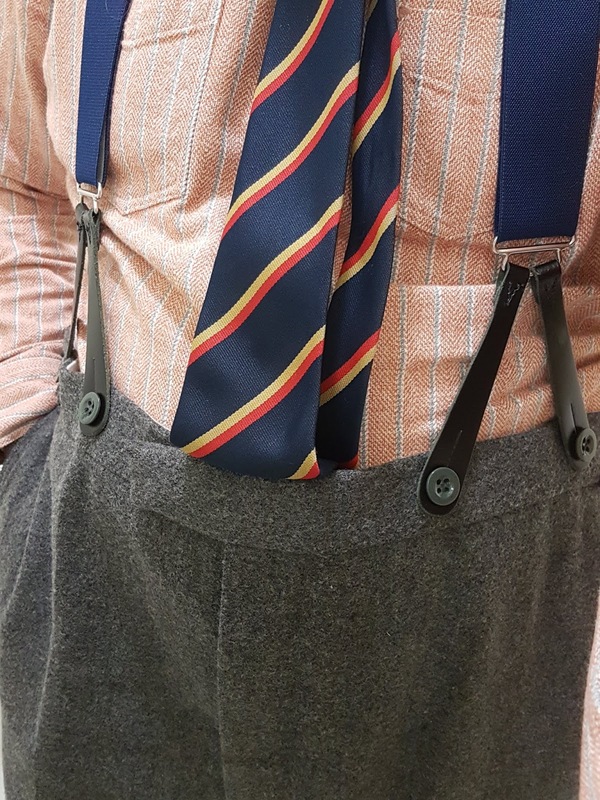 I tend to keep a pair of braces attached to my trousers when hung up - the braces on my grey pair are a dark blue set from Darcy Clothing. As the rust shirt has a subtle blue stripe running through it, that was decision made. I’m on a roll now. I can almost leave the house. But not quite. I still need some socks, a pair of shoes, a jacket, a tie, a pocket square and perhaps a lapel pin. Come to think of it, I’m nowhere near ready to leave the house. I almost exclusively wear socks from Marco John’s. Apologies for the apostrophe, it’s not my fault. I like Marco John’s socks because they are usually very colourful and always very well made. 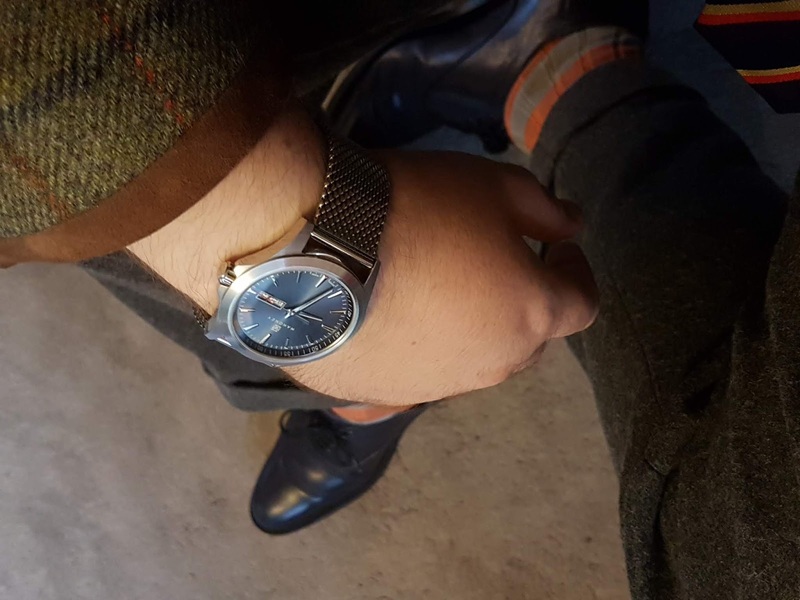 I was first sent a pair for review on this periodical more than four years ago and that same pair is going strong. There’s only one pair out of twenty or so that I now own which has ever developed a hole – and it’s a small hole at that. As we the shirt is an orangey rust colour, I decide to go for an orange pair. 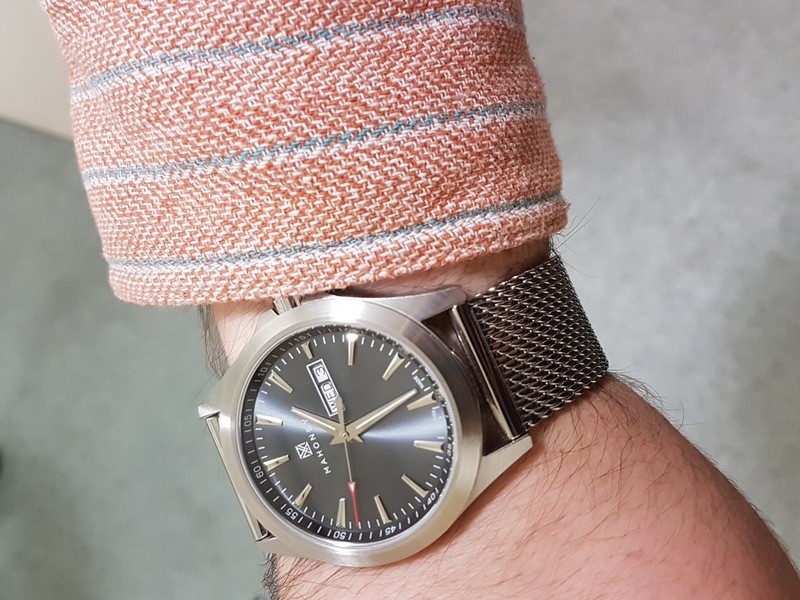 I have a couple of orange ones and as luck would have it, one of these is orange and grey – complementing my shirt and trouser choices perfectly. Next up is the tie decision. This can be a tricky one. I have around 80 ties in my collection now, which my beloved feels is slightly ridiculous. Being the aspiring gentleman that I am, I don’t mention anything in response about handbags. I keep my ties on these tie hangers – one I found in a charity shop and two more on eBay. As I’ve ran out of room on the tie hangers, I’ve currently resorted to storing the rest of my ties draped over an ordinary hanger. As I reached for one of the tie hangers from my wardrobe, a tie suddenly dropped at my feet. A stripey number, I picked it up and admired it. Boasting a French label, it also has another label that says that the tie is made with polyester. 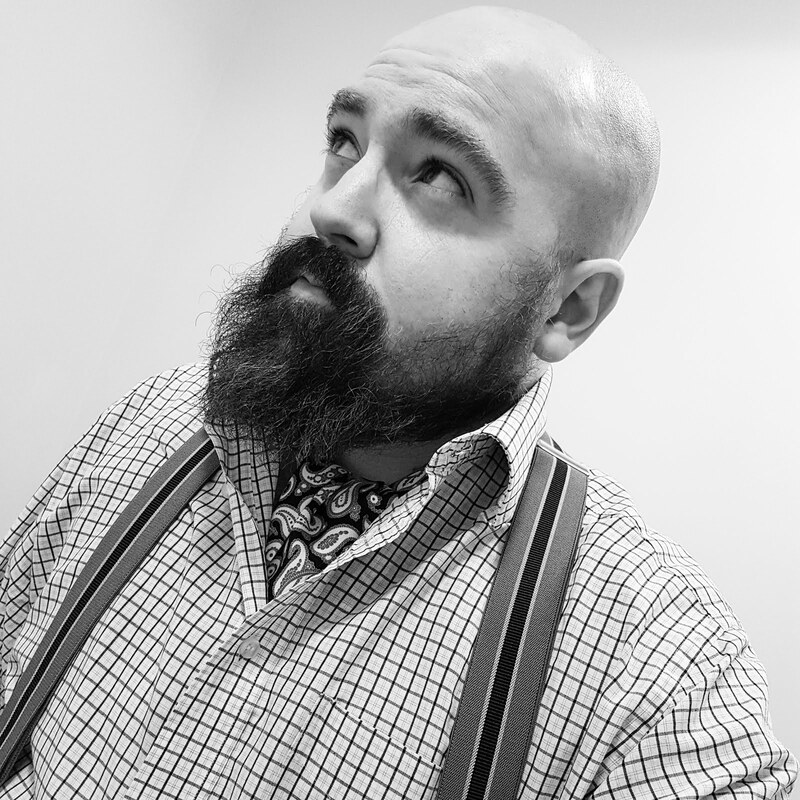 Usually I shun synthetic materials but when I spotted the tie in a charity shop, I couldn’t resist it. The stripes won me over. 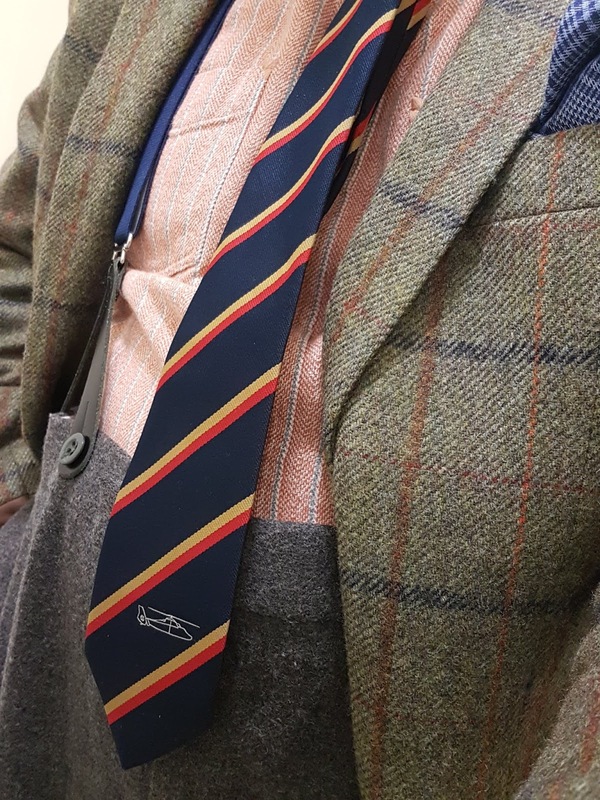 A dark blue base with red and yellow stripes, it seemed to go rather well with my rust shirt as I held the tie against it. Ok, decision made. That was fortuitous. A jacket is next. I have a few that work well with the grey and orange colour palette. A navy jacket would have worked well, but could perhaps be a little too dark. I decided to go for my Samuel Windsor tweed jacket that has a lovely orange, blue and brown overcheck. The orange and blue in the jacket would work really well with the shirt and tie. I’m all for pattern mixing, but try to keep it to no more around three, four at a push. The finishing touch for this particular outfit was a pocket square. As the shirt has a subtle stripe pattern while the tie has a bold stripe and the tweed has a distinctive overcheck, I felt that a simple pocket square would be the best choice. I don't really have any solid coloured pocket squares, so went for a simple blue one I have, a present from Charles Tyrwhitt. Perfect. 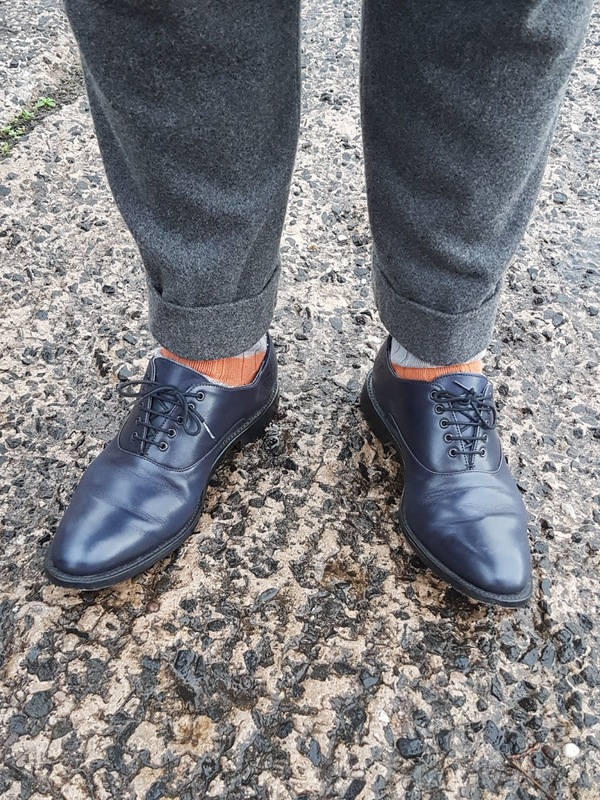 And then for the feet, I decided that I may as well go the whole hog and wear my blue Percy Stride oxfords. So there you have it. That is how I typically put an outfit together. Before leaving the house, I added my olive Barbour and off I ventured. I do hope you found this of some interest.